Greetings to you, I am Minister Louis Farrakhan, National Representative of the Honorable Elijah Muhammad, The Eternal Leader of The Nation of Islam, The Great Preacher of Freedom, Justice and Equality for Black people in America and our people throughout the world, and a Warner to the government and people of the United States of America and the nations of the Earth. Many expected the Mayan Prophecy of 2012 and “the end of the world” to take place on December 21, 2012. I do not represent a man who gave us the exact time; I represent a man who said what the scripture says in the Book of Matthew, Chapter 24, that “no man knows the hour” but God Himself, Who is bringing that Hour of Judgment to pass. However, we have been given, in both the Bible and The Qur’an, signs that we should look at; and then, contemplate and measure our actions according to The Signs of The Time. What is the special meaning of “The” Time, where the definite article is used? What is the meaning of “Time”? What is the meaning of “What” and the meaning of “Must” and the meaning of “Be”? What is the meaning of the past participle of the verb “to do”—that which is “Done”? According to the dictionary, “Time” is a system of distinguishing events. I’d like to stop there for a moment, because when we look at the events that are taking place on our planet, this should tell us how to distinguish the time that we have entered. America, the greatest nation in the last 6,000 years, is in a time of trouble like America has never experienced! Look at the confusion in our government; why, the latest statistics say that only 11 percent of the American people favor the U.S. Congress—that means that 89 percent of the American people are dissatisfied with the Legislative body of this nation. The people are not satisfied, completely, with The Judicial Branch; nor are they completely satisfied with The Executive Branch, so when you have “dissatisfaction” in a country that has almost reached “100 percent,” this type of dissatisfaction demands a change! 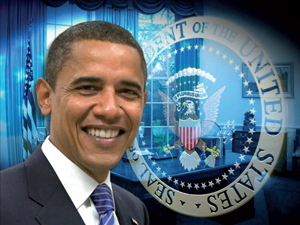 President Obama wisely chose the theme of “Change You Can Believe In” when he was struggling to become the President of the United States of America. And since the people of America are so dissatisfied, that theme of “change,” and the narrative of “change,” struck a responsive chord in the American people, and they overwhelmingly supported Barack Obama with their money and with their vote. People stood in line for hours because they wanted real, substantive change in what they see as the decline of America as “a great power” in the world. And after four years, they are not “satisfied.” They’re more dissatisfied because the “change” that they hoped to see, the “change” that they voted for: It has not come. I don’t want you to be so disappointed in President Obama, because he wanted to make a change; but that’s not “The Change” that God, through His prophets, prophesied would come! What is prophesied is not a “change of parties in power,” it’s is not a “change” of that which will bring “a job or two”—no, no, no! We are living in a Time that is called “The Change of Worlds”—and it is a universal change! 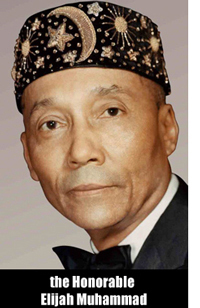 The Honorable Elijah Muhammad pointed out to us that God pointed out to him “two stars in the sky”: A red and a blue one that appear once every 50,000 years. Those stars are now in the universe, and it signifies not just a “change,” but a universal change! This runs right in harmony with the prophecies of the Bible where The Christ Figure is saying that there will be: “A new heaven and a new earth, and the former things shall pass away” (Isaiah 65:17). The Honorable Elijah Muhammad taught us that it’s not necessarily talking about “new planets,” “new stars,” “new Earth”—although all of that will come billions of years from now; but we don’t have to worry about that because we won’t be here at all to experience that. But he said it’s talking about a new “Spiritual System” and a new “Political System of Governance” for the Earth and its people. In these last “6,000 years” we have witnessed “the rise and fall of nations,” “the rise and fall of empires,” and we are now living in “The Fall of America”—the decline of this civilization! We are living in The Change of Worlds. Well then, Who is this “Son” that is prophesied to come that will be called “Wonderful Counselor,” “The Mighty God,” “The Prince of Peace,” The Everlasting Father”; and of the increase of His Government of Peace there shall be “no end”? “The Kingdom of God” is that Eternal Government that will bring Peace, Freedom, Justice and Equality to every human being that will survive The War of Armageddon, and the end of this system of things. What does it mean by a “habitation of devils”; and what is a “devil”? “Devil” here, the Honorable Elijah Muhammad teaches us, are those who are given to rebelling against The Way and Life and Law of God. As you know, everything that you buy in the store that represents a new gadget, a new car, a new appliance: It always comes with instructions for those of us who buy that new gadget, that new car, that new thing; that we must study the manual so that we will know how to utilize this thing, that we can get the fullest potential out of what we have purchased. But did you think that you could buy something like an iron or a computer; or, you can buy some chemical for use on your face or in your hair, some medicine that you, your doctors have prescribed—and there is not a way to utilize what you have gained for some benefit for yourself? So, the world in which we live was doomed from the day it began, and where we are, right now, is at The Time of The Doom of this present world. If that is so, then let us look and see “The Signs”: “Great” America … are we in obedience to God? Or have we become a “nation of devils”? Is the world in which we live in obedience to God? The inhabitants of our planet … are we in obedience to The Will of God? Are we living that beautiful Life of “joy” and “peace” that obedience to God will bring? I don’t think so. So because we are in rebellion, the scriptures teach “death passed to all human beings” (Romans 5:12). The human being today is but a caricature of what God intends for the human being because the death of the spirit is producing the death of the world! To my dear pastors and my dear people: This world was doomed from the day it came into existence. This is a world that all the prophets saw going down into utter destruction. God would not give the life of His “Son” for a world that He had already sent His prophets into the world to prophesy of its doom! No… The Honorable Elijah Muhammad taught us that the “world” that scripture is talking about is “The World” that Jesus, The Christ—and The Great Mahdi and Messiah—are bringing in! That He would give His life for that world; that whosoever would believe in Him and come out of a life of rebellion, would come out of the death of this world into The Life of The World to come! And there is no end to that World that is destined to come into existence after the power of this world is broken. Let’s look at America: She is over $16 trillion in debt, not considering the amount of debt from Medicare, Medicaid or Social Security. Isn’t it something that when Social Security was initiated, it was a sacred trust for the people that worked; that out of their salaries would come funds that would be there for them after they retire? Do you know that when you violate “trust,” and begin to misuse funds that were allocated for one purpose—but, because you had authority, you use it for another—that’s a criminal offense in any country? Here we are in America where pension funds, and Social Security funds in particular, of the American people, have been used for other purposes! And now they’re saying, “Oh my God, we don’t have enough money for the Baby Boomers…” if they begin to ask for Social Security. And “The future doesn’t look so good, so maybe we better raise the age of retirement from 65 to 67…” That won’t be enough, because soon they’ll raise it to “70”—and that won’t be enough! Then they’ll say, “Well, you have to be ‘100’ in order to get money…” because the money will be gone! These people in government have violated the trust of the American worker, and those “chickens are now coming home to roost”: It is said that America is “great,” but yet she is leasing her roads and toll bridges, leasing her seaports to foreign governments and corporate entities; and selling government buildings to those who can buy them—then renting buildings she once used to own. Isn’t that “a nation in decline”? So the real “arch enemy” of America is Satan himself! What pastor, or what church, can put a “stamp of approval” on what God does not approve, and yet be “true” to Jesus Christ? This is pitiful of you, that you would “sanction” what God condemns! That shows you how confused you are in your devilishment! The scripture teaches in the Book of Isaiah, Chapter 25, verse 10 that God saw human beings as “a mountain of dung”: “For in this mountain shall the hand of the Lord rest, and Moab shall be trodden down under him, even as straw is trodden down for the dunghill.” “Dung” is excrement. My God! If God Himself sees “humanity” as dung—and “dung” is only used to produce energy for something that is “moving on,” or dung is used as a “fertilizer,” then is this what the doom is referring to, that those of us who reject The Time will be “in loss”—except those who believe in The Knowledge of The Time, and begin the doing of good, and exhorting each other to truth, and exalting each other to patience? “The Time and What Must Be Done”: When we speak of “time,” it’s usually the counting of “the seconds” (60) and “the minutes” (60) that make up “one hour”. As I mentioned before, the Holy Qur’an speaks of a “shock of the Hour”: What “The Hour” is referring to, as the Honorable Elijah Muhammad has taught us, is The Hour of The Doom of a People whose “time” has come! In the Bible, in the Book of Revelations, Chapter 13, verse 18, it reads, “Here is wisdom. Let him that hath understanding count the number of the beast: for it is the number of a man; and his number is Six hundred threescore and six”. “Six hundred” means the “600 years” that it took to take a people from Black to Brown to Yellow to White. “Threescore” is “60,” which the Honorable Elijah Muhammad says it means a number of years that constitute a “Time of Grace” for you to get your act together, so that you will not lose in this Hour. And “six,” the Honorable Elijah Muhammad says, means the “60,000 people” that were used in the making of the man that is presently ruling our planet. This is talking about the life of a “man”; but, “the beast” is a man. And it’s not hard to consider this when you look at what America has done, and what her policies have been to the people of the world. But not only “America,” for Europe, England, Italy and Germany: You’re in this! Look at how you have treated other human beings—you have murdered them outside of The Law of Justice. Did not you think that there would be a Time of Reckoning? For The Wicked, this is that Time. The confusion that is in our government, where the “Republicans” and “Democrats” can’t seem to agree: Partisan politics is sentencing “democracy” to death. It is those who “run” the country; those who are The Legislative Branch of the country who are supposed to represent the People (their “constituents”)—yet, they are “bought and paid for” by special interests, and by those who control the policies and direction of our government. The American people are not aware of policies that this government has initiated that have turned nations of the Earth into hatred for America! These people don’t necessarily hate the American people, they hate the government of America. “The Time and What Must Be Done”: What does “what” mean in the context of that subject matter? It means a method. What is The Method that we should adopt once we know The Time? What is The Way that we should go when we know The Time? In Proverbs 14:12, the scripture teaches: “There is a way that seemeth right unto a man, but the ends of thereof are the ways of death.” In Isaiah 55:8-9, God tell us: “My ways are not your ways, and My thoughts are not your thoughts. I am from above while you are from beneath.” So when “The Christ Figure” comes into the world; when The Mahdi of the Muslims and The Messiah of the Jews comes into the world, He comes bringing “a way out of” The Doom and Destruction of this world, if we would avail ourselves of “The Way”. Jesus said: “I am The Way, The Truth and The Life.” What Jesus is saying is that in his person, his “way” and his “life” is “The Way” to get out of the doom and destruction that is prophesied for the world and its people! Jesus not only is “The Way” and “The Life”—but He is The Truth: He comes bringing The Truth of The Time in which we live. And if only we agree that we are living at The End of The Time of this world of “death,” “hatred,” “division,” “racism,” “sexism,” “materialism,” then we will all see that we are at The End of it all. “How long do we have?” My dear Brothers and Sisters, my dear people of America and the world, “The Time” is limited. It is so short … At this moment that I am speaking to you, America is rushing headlong into war again, which will trigger Armageddon which will bring about the destruction of the power of this world to continue to exercise sway over the people. “The Time and What Must Be Done”: We know that we are at “the end of this system of things,” we know we’re at the end of this “time,” we know that America is in “decline”—and when America goes down, she takes the world down with her. The economy of the whole world is tied to the economy of America … so as “the dollar” weakens, as the dollar falls, as the dollar collapses: Where will the fiat money of Europe and the world go? Oh, my brothers and sisters, this Time is so serious! But there’s a “Must” here: What is a “must” is that which is necessary, or an essential thing. “What Must Be Done” is Essential to Life itself, and that is a real change has to come! And I must respectfully say to the American people that although you voted for President Obama: He’ll try, but he’ll never be able to do that which will satisfy “the hope” in the people’s heart for The Real Change that is prophesied to come. We should “vote” for Christ; we should “vote” for The Mahdi, we should “vote” for The Messiah, for it is They that have been prophesied to bring in a “New World,” A World of Peace, A World of Freedom, Justice and Equality, A World of Obedience to The Will of God—A World that will give us Joy and Love and Brotherhood. A World where no one will go to sleep hungry at night; a World where all the people that live will be properly educated, and will be free to develop themselves to their fullest potential to use their gifts and skills in The Way of God. That’s The World that is coming in. You know, before the Honorable Elijah Muhammad left, he said to me: “Brother, don’t you change The Teachings while I am gone. And if you are faithful, I will reveal the New Teaching through you.” There is a “New Message” coming, and that New Message is Guidance for The World that will be in existence after the fall of this one. That “Message” He promised that he would give it to me if I remained faithful. I’m doing my very best to remain faithful to his Word, and give it to you regardless of the consequences for telling The Truth. What will America do when her own dissatisfied people lash out at injustice? Brother Muammar Gadhafi did good for his people; and if you had left him alone, the confusion would not be in Libya as it is today. But you wanted him gone! And you have meddled in all of these governments … You don’t tell the American people that the “Neo-Conservatives”—those with a Project for a New American Century—had a plan to overthrow and have “regime change” not only in Libya, but in Lebanon, in Syria, in Iran, and in other countries! And our government, The Congress of the United States, took on $150 million of taxpayer money and allocated it to produce regime change in Iran! America: What business is it of yours what government is going on in another country that you would spend our dollars, and then interfere in another man’s house? Did not you think that that would “come home” to you? Look how you went and killed Brother Gadhafi! And you said that you killed him because he “killed his own people.” Look at what you are saying about Bashar al-Assad of Syria: “He must go because he’s killing his own people.” Have you considered the dissatisfaction that is growing in America? 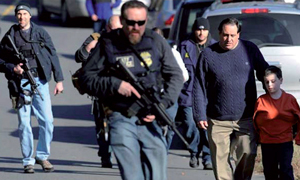 Why did the Department of Homeland Security purchase 750 million rounds of hollow-point bullets in 2012? Are you expecting “civil disturbance” in America? And if this “fiscal cliff” is not bridged economically, and America’s Republicans and Democrats don’t agree, what will be the situation in this country not only with “taxes for the poor and the middle class”—no, no, no… What will be the condition of those who have not worked for a long time? From what I have read in published reports, 2.1 million Americans who are unemployed will lose unemployment assistance. That’s two million Americans, now, with no money, no job, and no means of feeding and clothing and sheltering themselves! What do you do when the people cannot find bread to eat? What do you do when they begin to break into homes, or rise up against constituted authority? The killing of those innocent children in Newtown, Connecticut on December 14, 2012 that affected every American with a heart: None of us could look at our televisions and not feel the pain of little children, 6 and 7 years of age, shot to death by a Bushmaster automatic rifle. No child shot, no teacher shot with less than “three bullets”; and some, with 11 bullets! What did those children’s bodies look like, that their mothers and fathers could not come and see their babies? I was sad to see our President during his press briefing on the massacre, who could not hold back the tears of pain and sorrow for such a horrific tragedy. I felt for our President, because you could see in the genuine tears his great “humanity”. But The Teachings of Jesus Christ says, “Do unto others as you would have done unto yourself”; and in Islam, in the Hadith of Prophet Muhammad, peace be upon him, he said that we are not “Muslims” or “righteous people” “until we love for our brother what we love for ourselves.” So in that moment of sadness, in that moment of grief—in that moment of extreme pain that I can say I felt for the parents, for the children, for the families, my mind went to our President. Do you know what it would mean, my dear Brother President, if you came into Chicago, in the hood, and met with those parents that have lost their children? And then you go into your “bully pulpit” and preach to us in a way that is not “talking down” to us, but talking to us as one who truly is compassionate for what America has done to us—and what we are now doing to ourselves? I want our government to see the drones that have gone into Afghanistan; the “shock and awe” of America’s bombers, and the bombs that fell in Iraq on the basis of a lie! I want us to think about the drones that were in Pakistan, in Yemen, in Somalia—of the men, the women, the children that were slaughtered; of families destroyed! Do you think that only Americans know how to love their children? Only Americans feel the pain of loss of our children? No, no, no! Every human being on the Earth feels such loss … Yet, we can walk away from such slaughter, and call it “collateral damage”? So, those innocent lives that were lost in Newtown: They should have brought us to some point of “sanity” where we not only feel the pain and suffering of the mothers and fathers of the children, and teachers and loved ones in Newtown; and in other places in America that have seen such tragedy and slaughter, but we would feel the pain of the Iraqis, the Afghans, the Yemeni, the Somalis, and others who are dying. And, the Palestinians in Gaza that are dying by American made bombs: So much so, that you have told Israel that you are going to “replace every bomb” that the Israeli Defense Forces dropped in their November 2012 mass-bombings of the Palestinians! Oh America, you are blinded, and that is why we must talk about “The Time and What Must Be Done”! America will never have ‘enough’ ‘guns’, ‘weapons of war’ to satiate her bloodlust. The killing of those children should tell you “guns” are not “the way” to peace; “guns” are not “the way” to real freedom and justice! The guns in America are destroying our peace and we have become the “No. 1” arms merchant to the world! We have more money spent on making weapons of war than the next three, four or five nations combined! We are not spending money on “Education” and “The Cultivation of The People” like we are spending for weapons of war—yet, in this “fiscal cliff,” we don’t want to “touch” the money that we spend for weapons of war? Don’t you have enough? Haven’t you said that the amount of atomic weapons that you have, you could “kill everyone on this planet several times over”—isn’t that enough? And when will “enough” be enough? So in America, there are 29 states that are now suffering drought. Famine is coming; and you are being beaten with hail and rain, and snow, and fire, and tornadoes, and hurricanes. God uses The Forces of Nature as His “arms,” and He said He will use all that He has against you! Can’t you see what is happening to America? One-third of the American people say they believe that the change in the weather is fulfilling Biblical prophecy of “end times”. So America, you must—if you are to survive: You must make a serious change to give America hope for an “extension of time,” and even a “future”. Black people: Clean up your act! U.S. Government: Stop lying to us! To my beloved Brothers and Sisters: We have to clean up our act! We have to make a serious change! We have our own foot in our own Way of Progress. 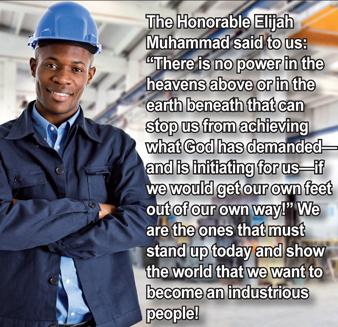 The Honorable Elijah Muhammad said to us: “There is no power in the heavens above or in the earth beneath that can stop us from achieving what God has demanded—and is initiating for us—if we would get our own feet out of our own way!” We are the ones that must stand up today and show the world that we want to become an industrious people! We want to build a nation of self! And we will be appealing to the government of the United States: “Stop lying to Black people! You have nothing more for us to do! You cannot make jobs for your own millions of unemployed, and ours too!” Why not tell the Black people of America and poor people, “The Truth” so that we can get on with The Business of “Doing Something For Ourselves”? And then, you should help us to go for self! We would make a great people if you helped us to go for our self! God is present today. God is not “to come,” He is in the world. May Allah Bless you with The Light of Understanding, as I greet you in peace: As Salaam Alaikum.